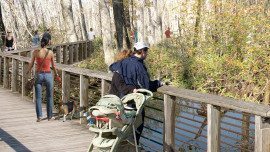 The Town of Holly Springs is expanding Bass Lake Park by acquiring Sugg Farm. 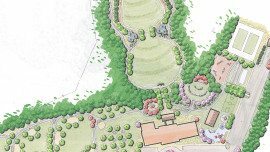 This 117-acre former horse and cattle farm, protected by a conservation easement controlled by the Triangle Land Conservancy, will provide a unique landscape and program offerings for the community. 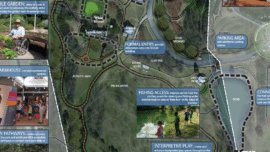 Alta Planning + Design worked with the town to master plan the 117 acres to complement the design and programming at Bass Lake and remain within the preservation and protection of the conservation easement. 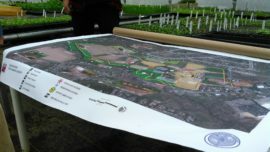 The planning process involved the formation of a 40-person steering committee, three rounds of public events, a series of stakeholder meetings, case study reviews, site analysis, and design. The final theme selected for the park is Education/Adventure and will be a phased plan to provide large event space, mountain bike trails, a dog park, raptor rehabilitation, a ropes course, a nature based playground, bouldering, a barn for farm animals, demonstration crop areas, a community garden, and several miles of trails.